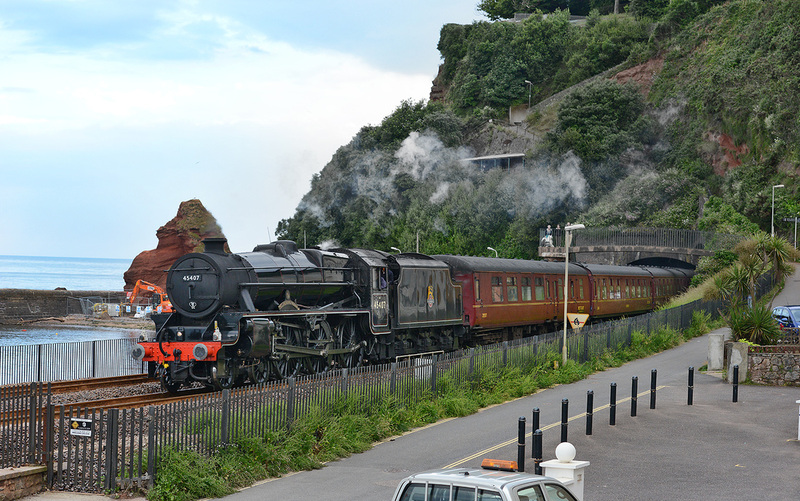 Black 5 No. 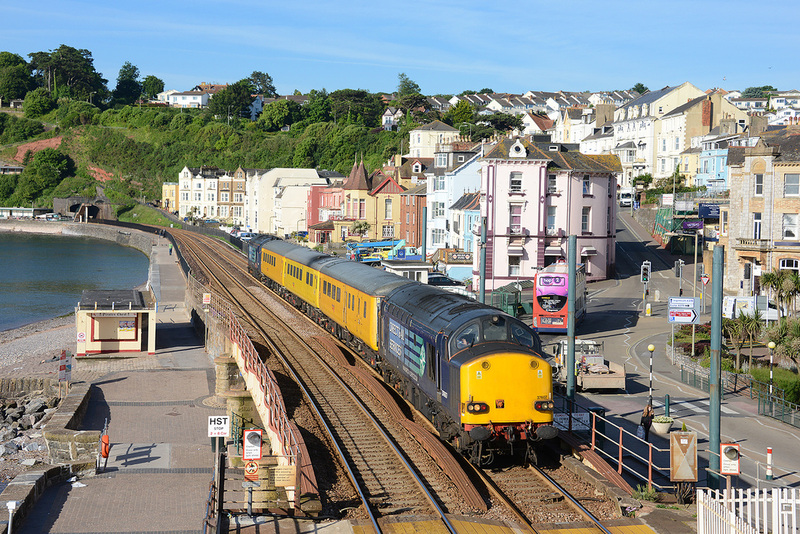 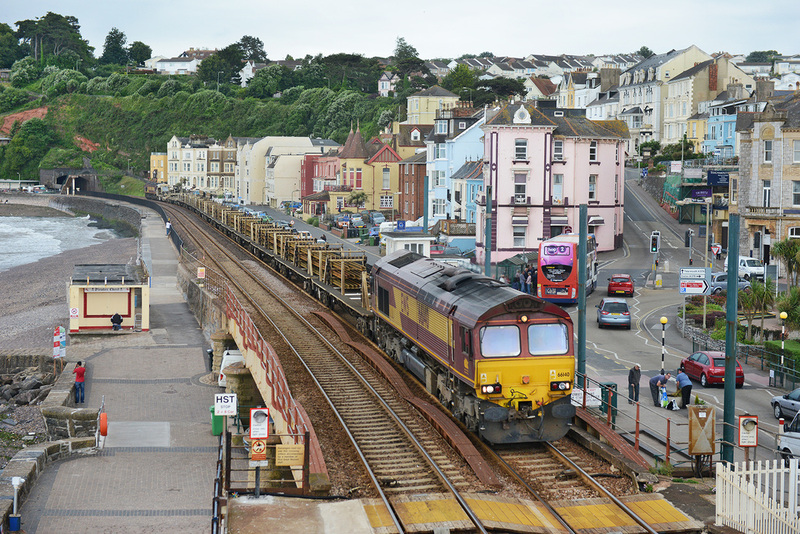 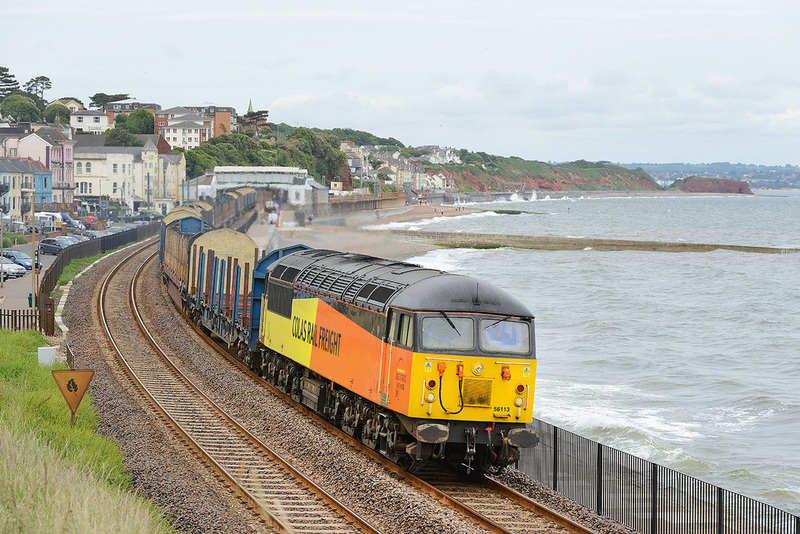 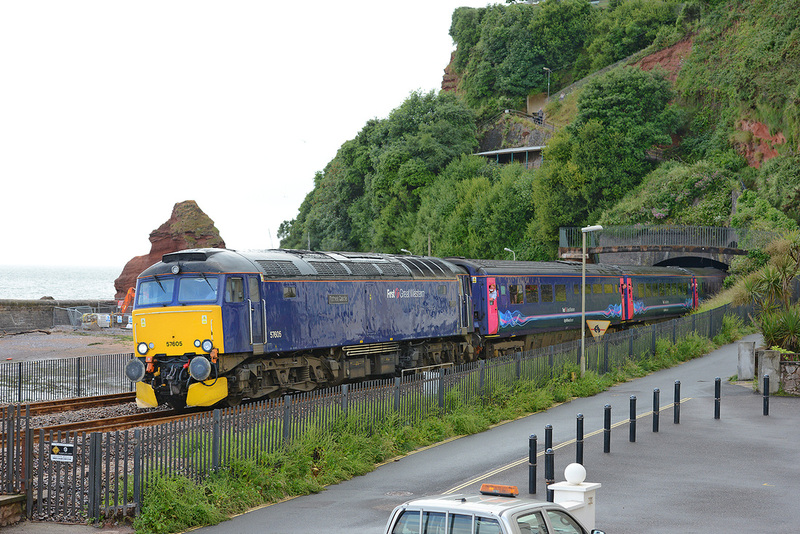 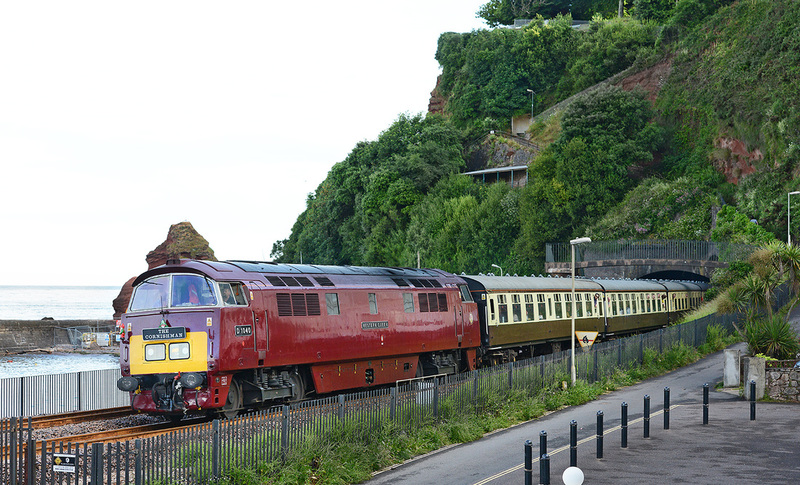 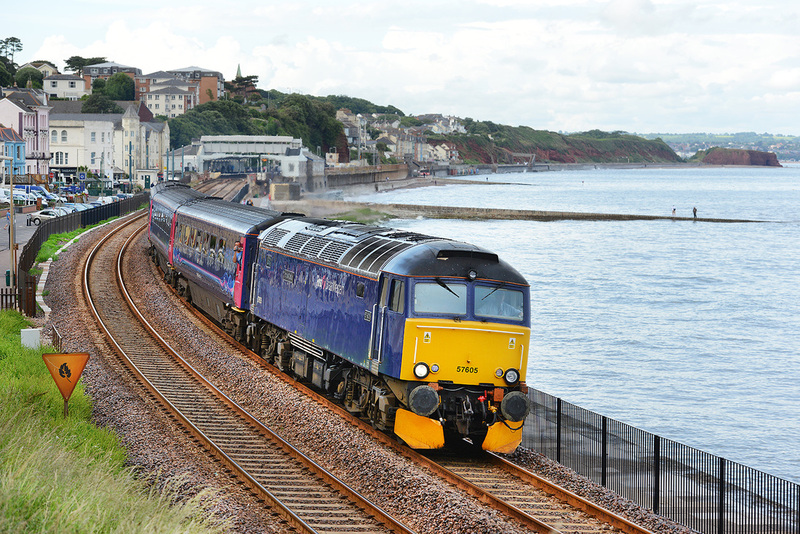 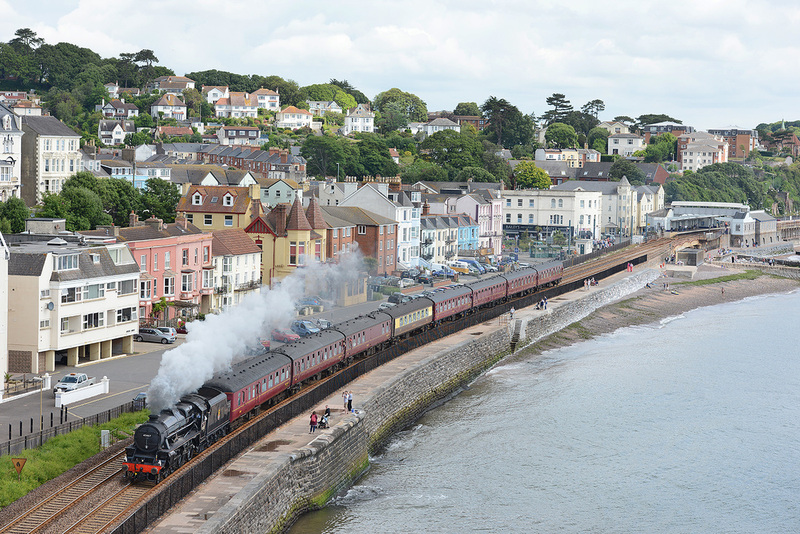 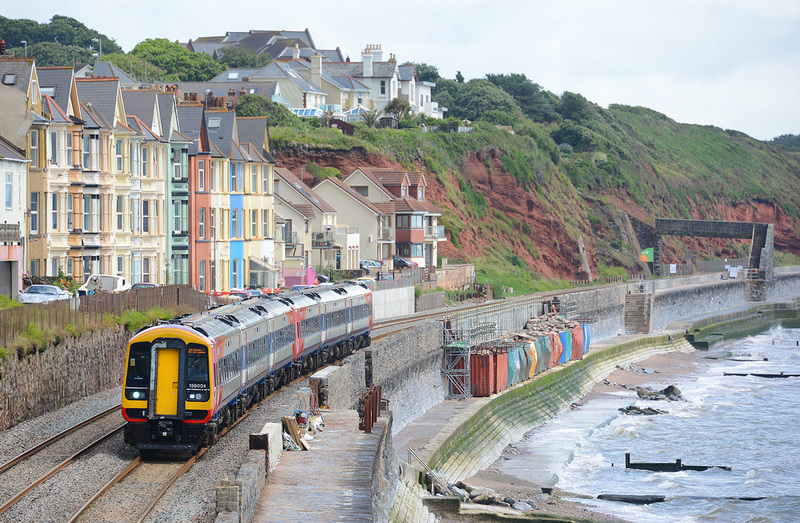 45407 storms west through Dawlish on 29 June 2014 leading 'The Royal Duchy' charter, the 08.12 Bristol to Par. 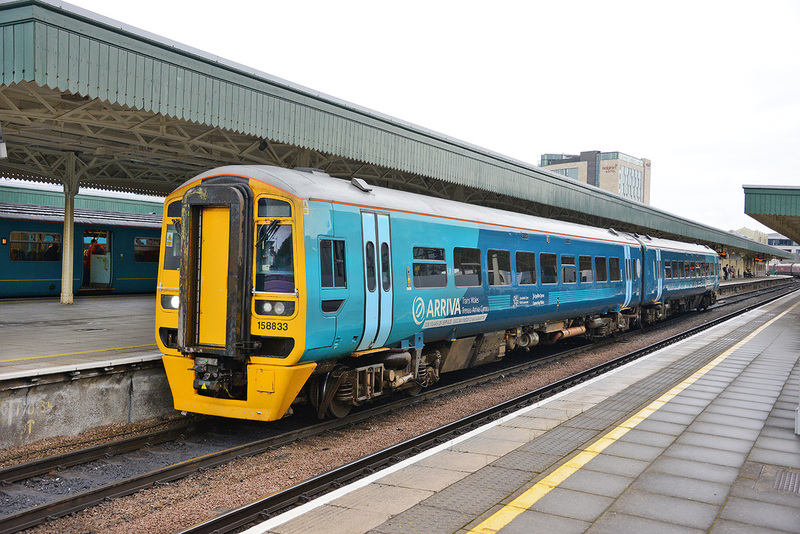 158833 stabled at Cardiff Central on 27 June 2014 displaying Arriva Trains 10 Years logo and branding. 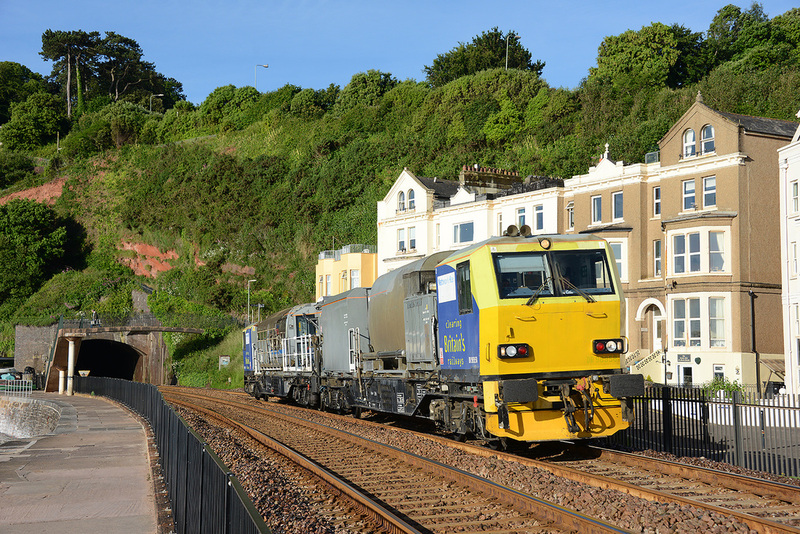 67001 with DVT No. 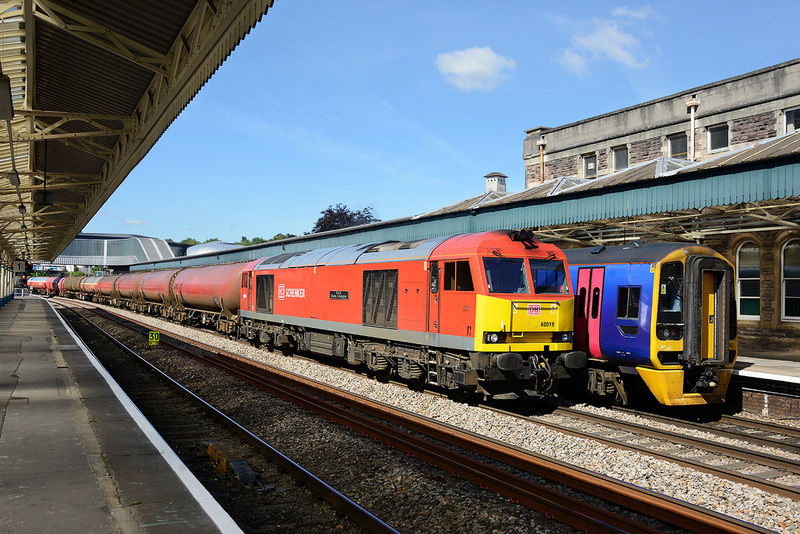 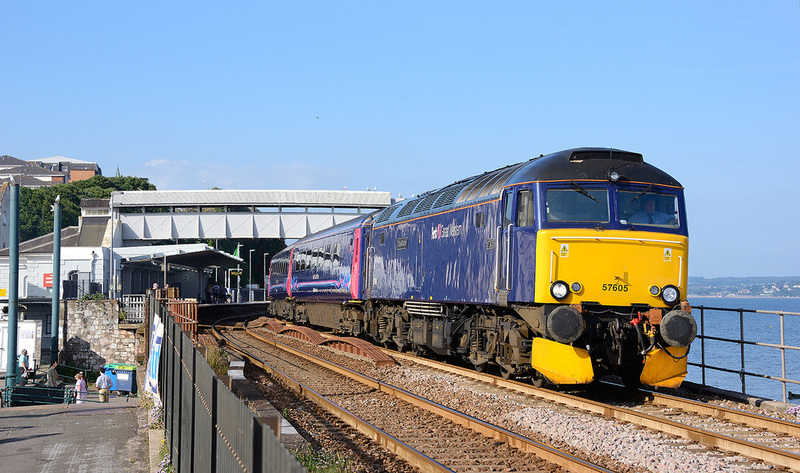 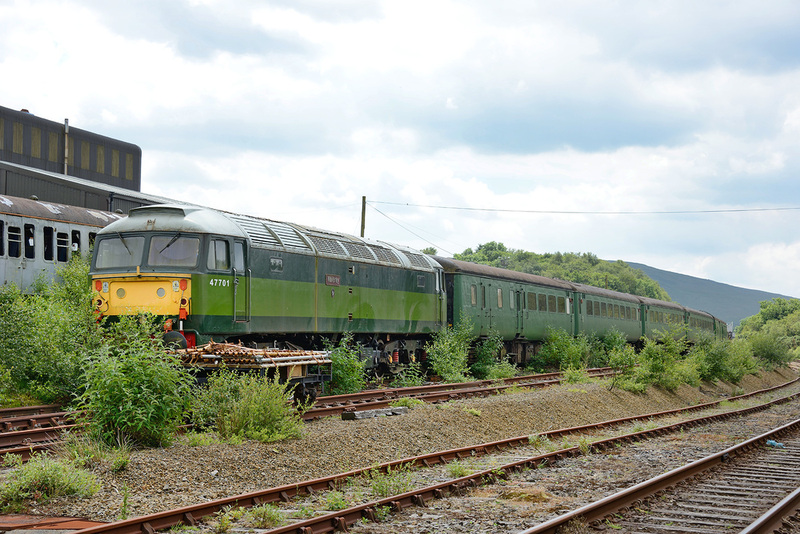 82308 at the rear arrives at Newport on 27 June 2014, 1V91 05.33 Holyhead to Cardiff. 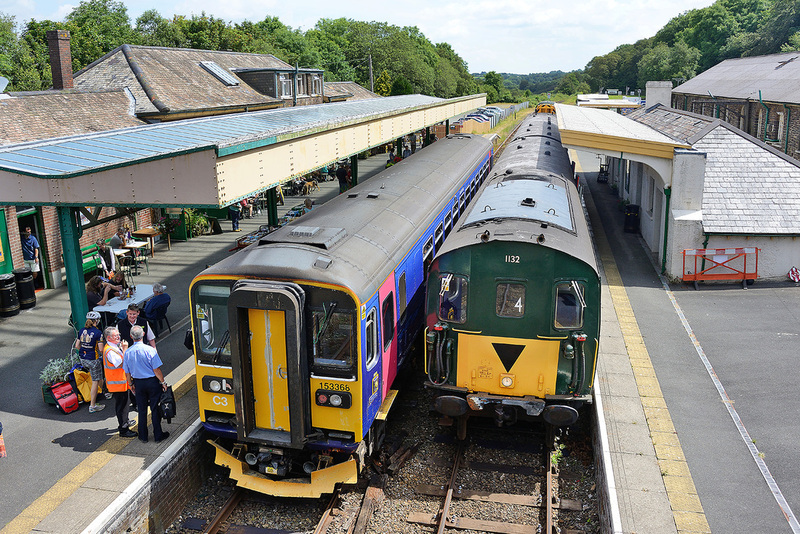 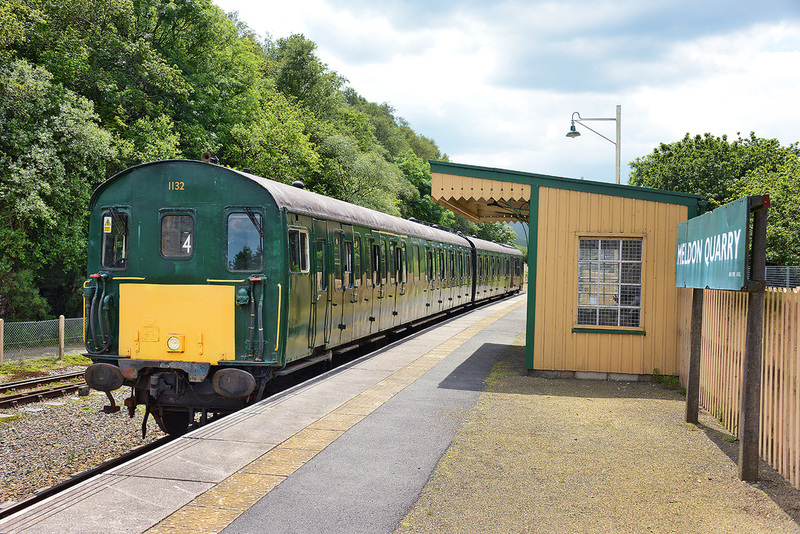 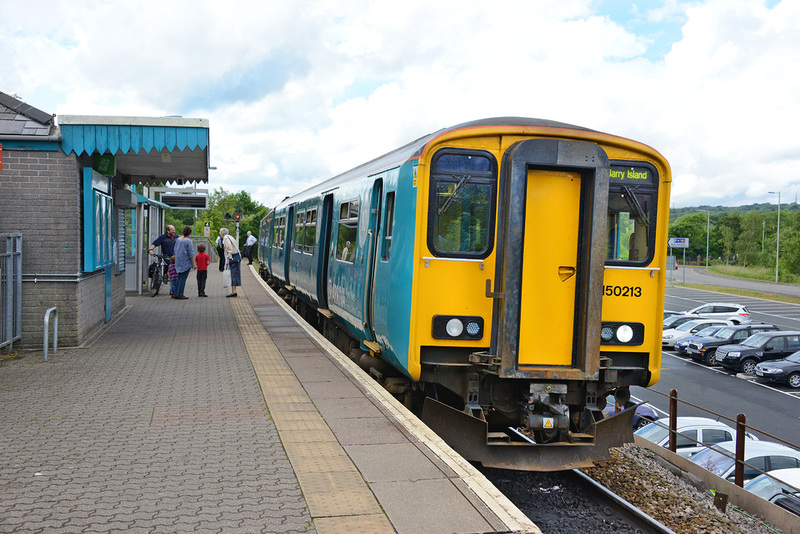 142073 and 142077 arrive at Rhymney on 27 June 2014 with train 2R08, the 11.02 from Penarth. 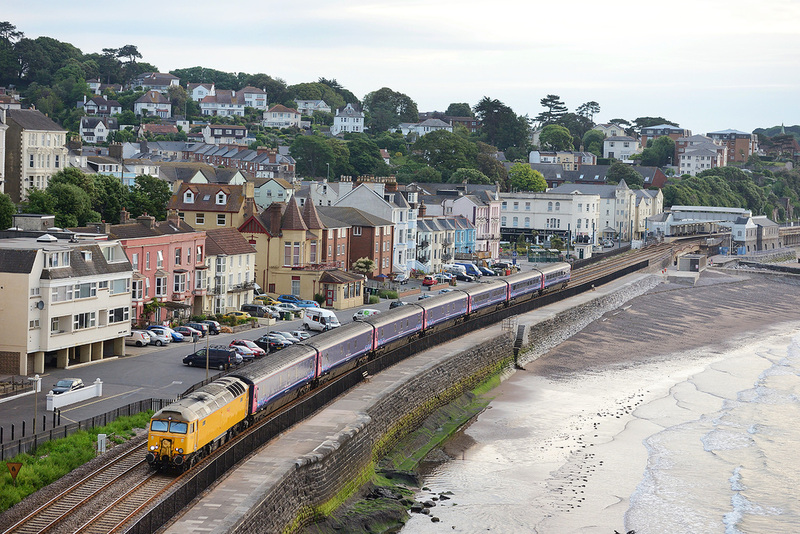 FGW Class 150/2 No. 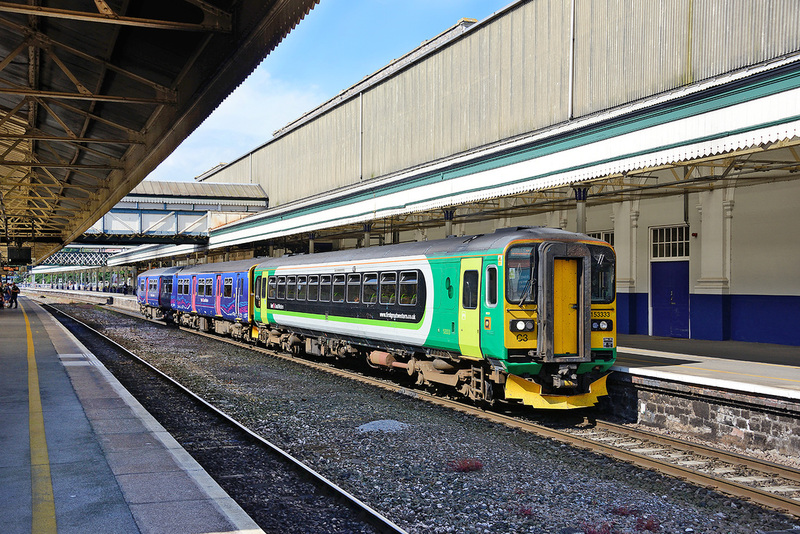 150233 and ex-London Midland liveried Class 153 No. 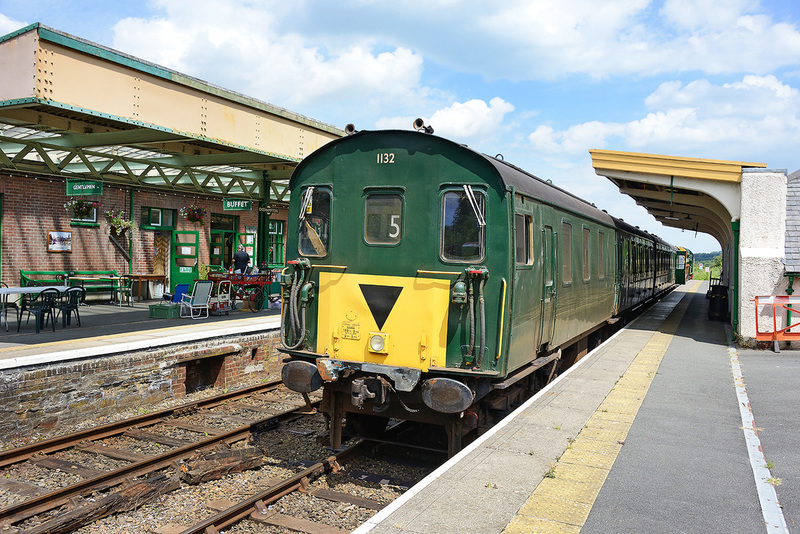 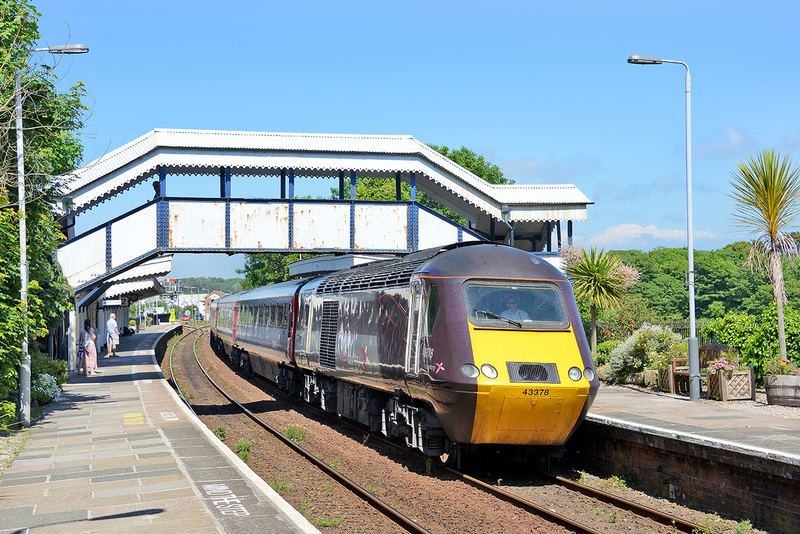 153333 arrive at Exeter St Davids on 22 June 2014 with train 2F16, 14.58 Paignton to Exmouth. 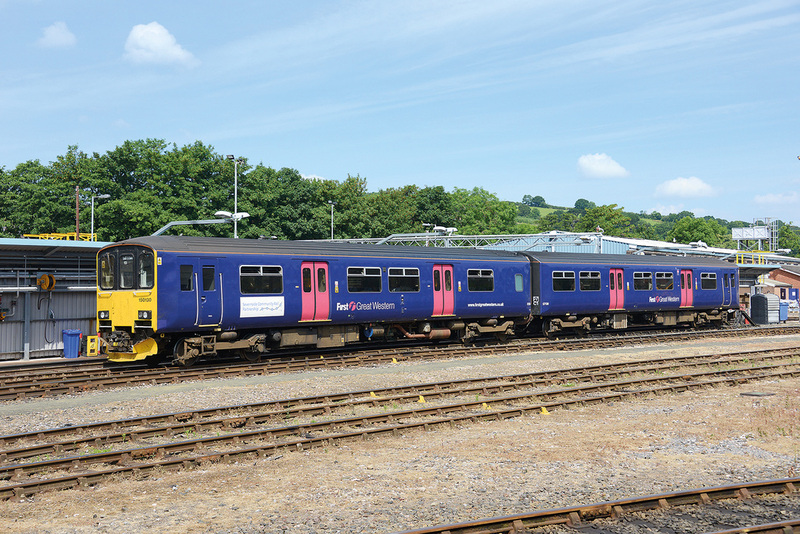 FGW Class 150/1 No. 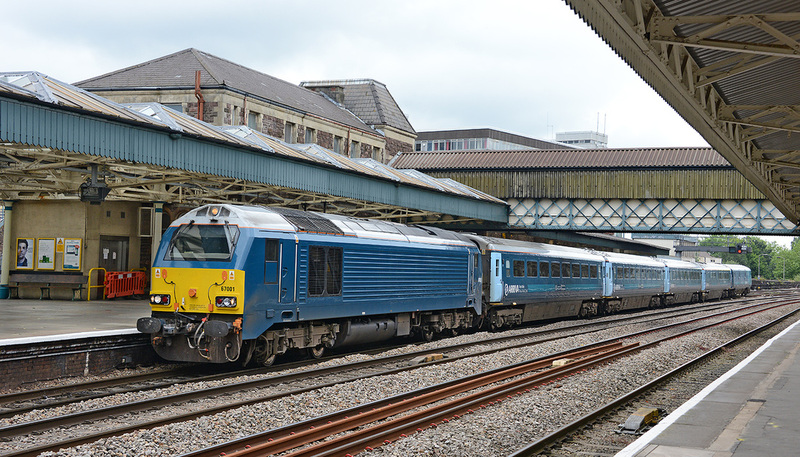 150130 'on shed' at Exeter St Davids. 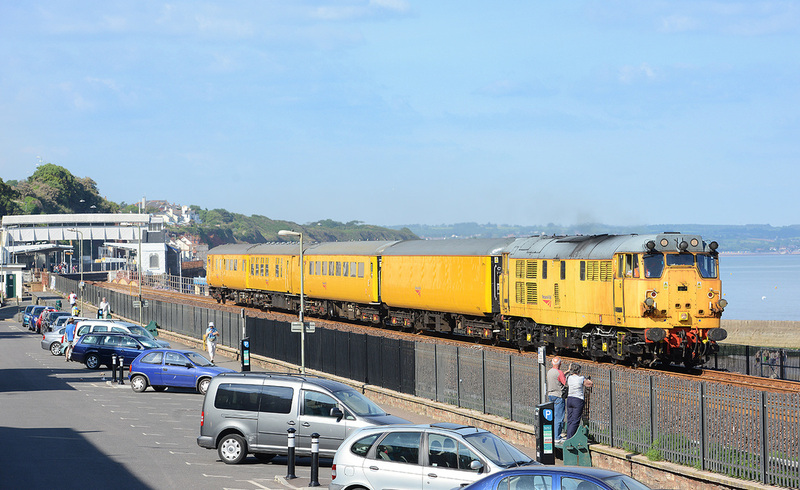 22 June 2014. 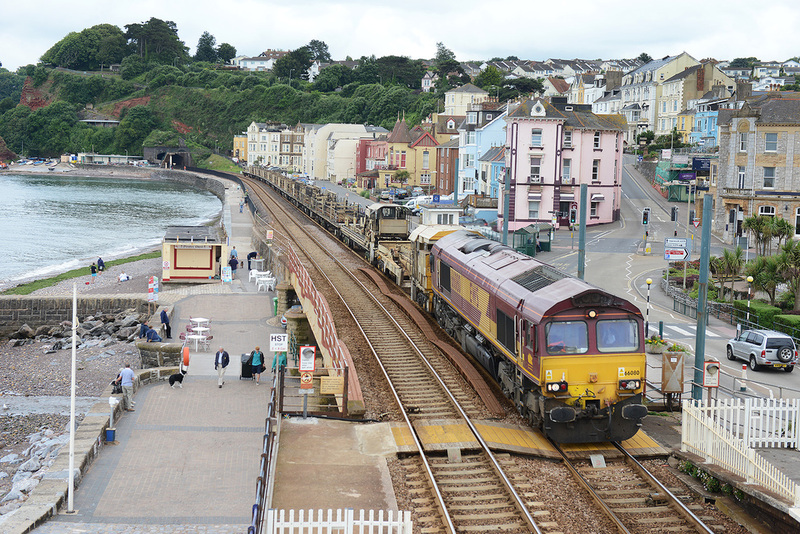 The Saturday only First Great Western loco-hauled duty, 2E75, the 11.25 Par to Exeter St Davids and the 2C51, 17.50 Exeter St Davids to Penzance are very popular with enthusiasts, with both photographers and haulage enthusiasts following the services. 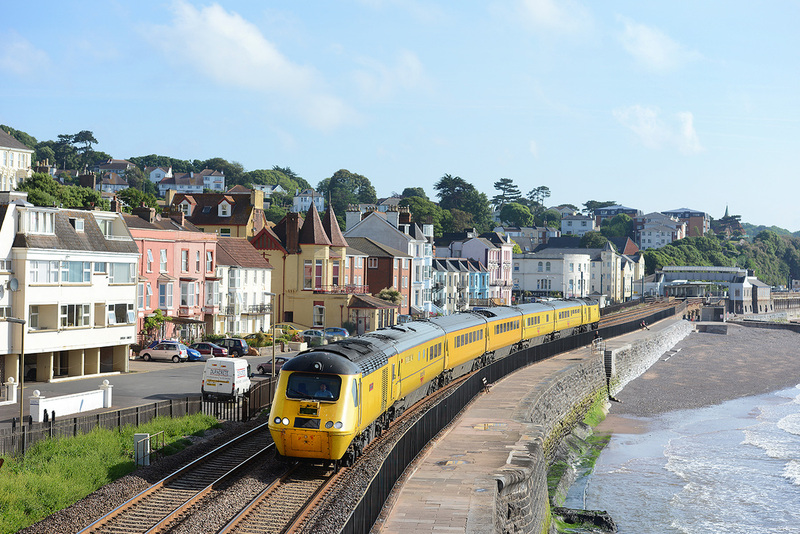 In near perfect sun on the longest day of the year - 21 June 2014, No. 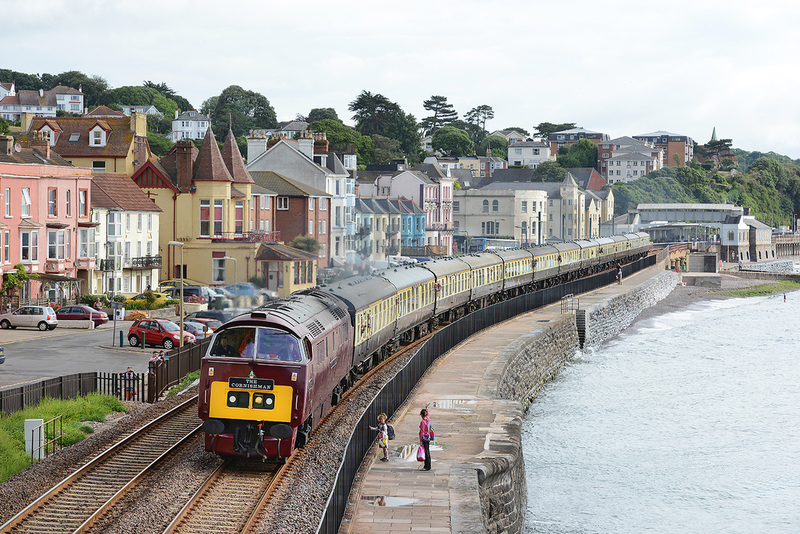 57305 Totnes Castle pulls away from Dawlish with the 17.50 Exeter to Penzance service. 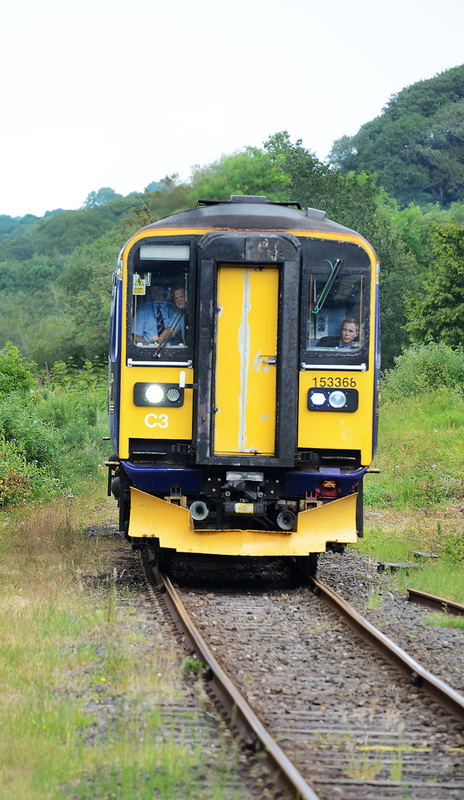 The train was formed of Mk3 vehicles Nos. 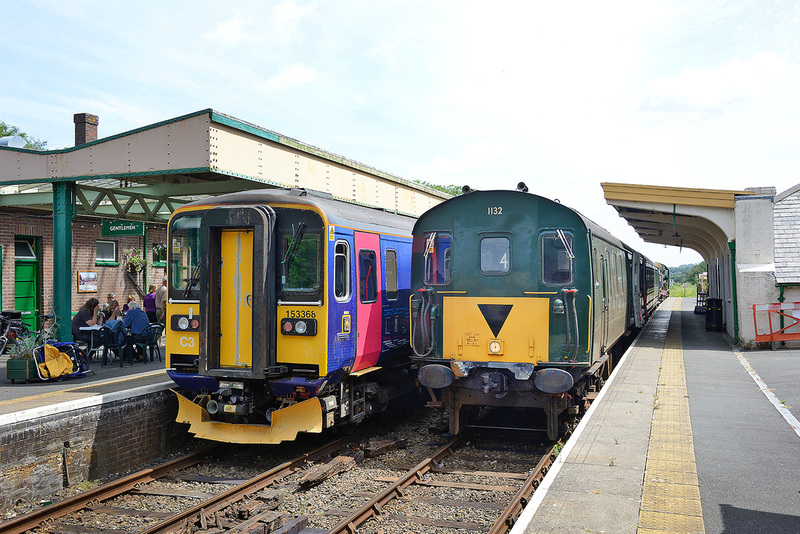 17175, 12161 and 10232. 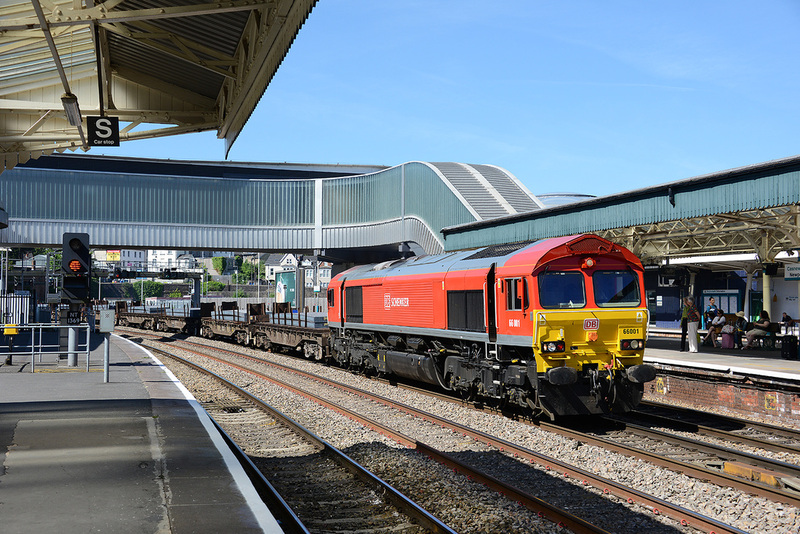 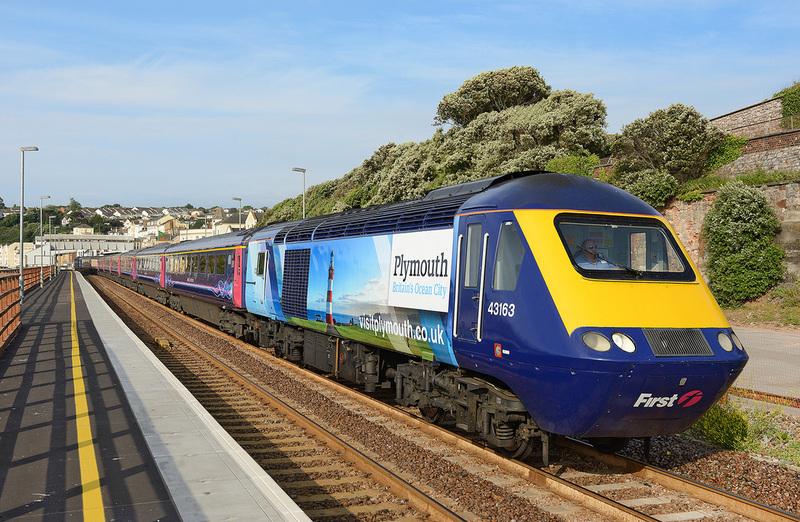 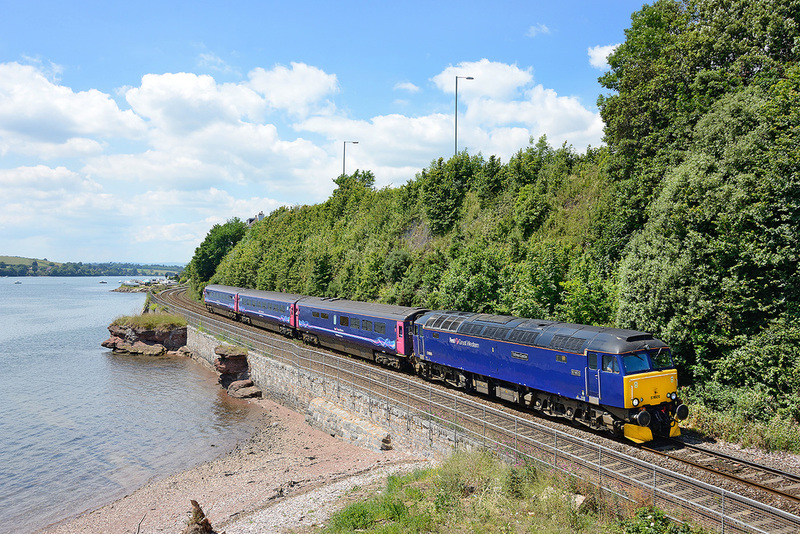 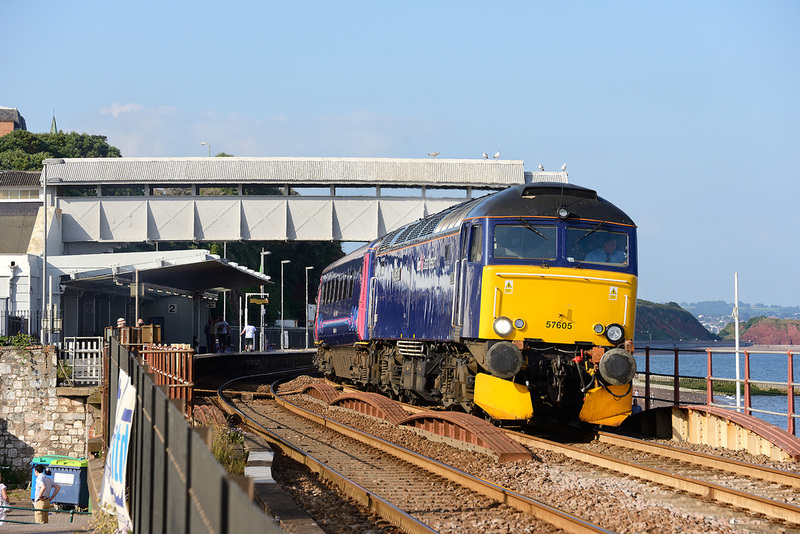 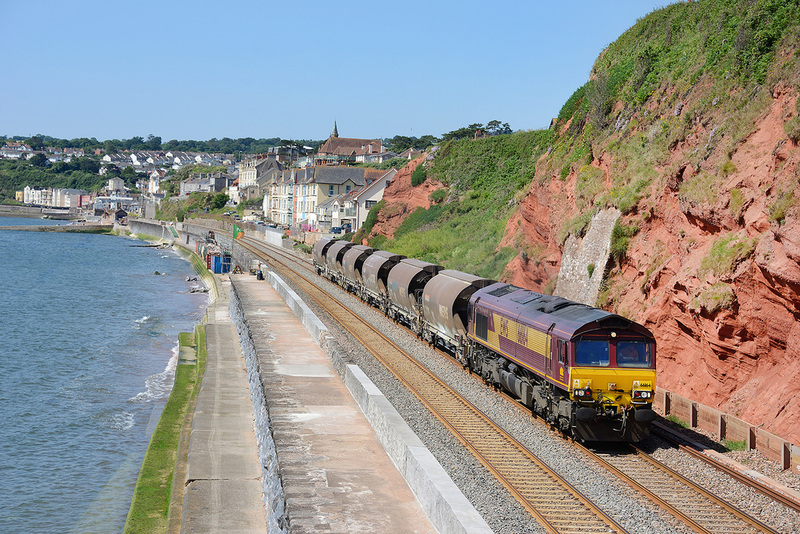 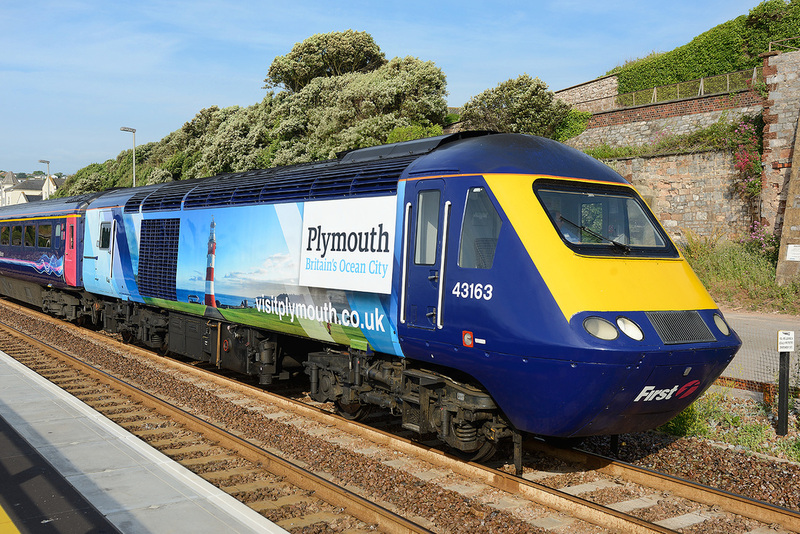 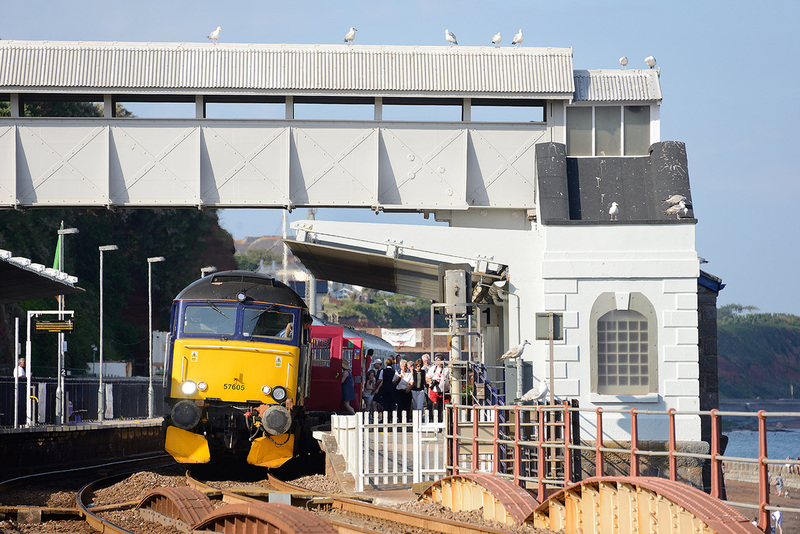 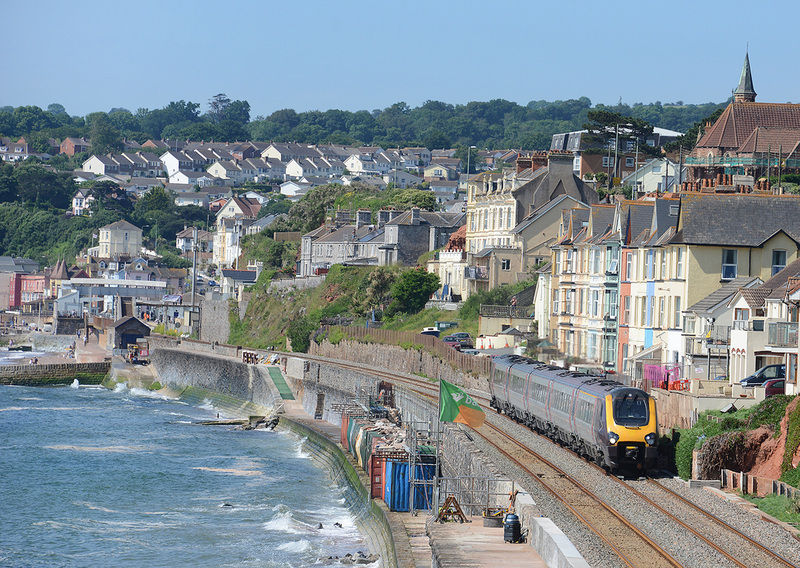 43014 The Railway Observer and 43062 John Armitt pass along the Dawlish Sea Wall, 1Q19, 10.01 Plymouth - Paddington on 20 June 2014. 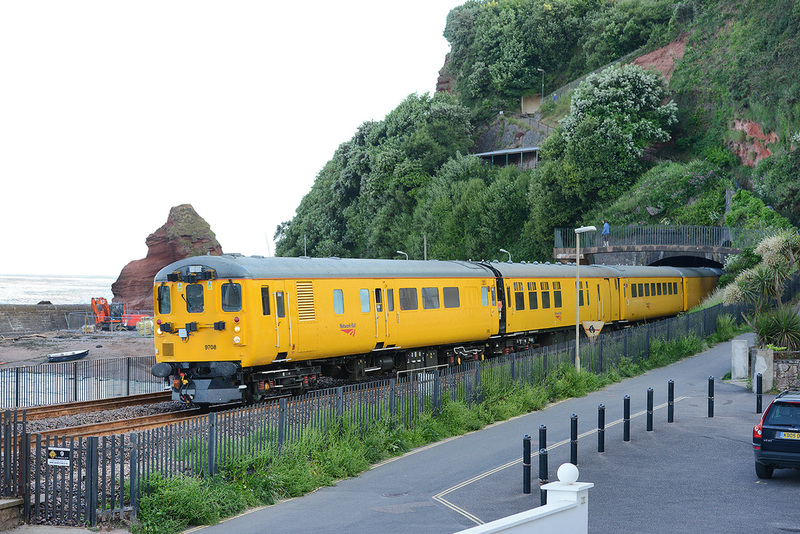 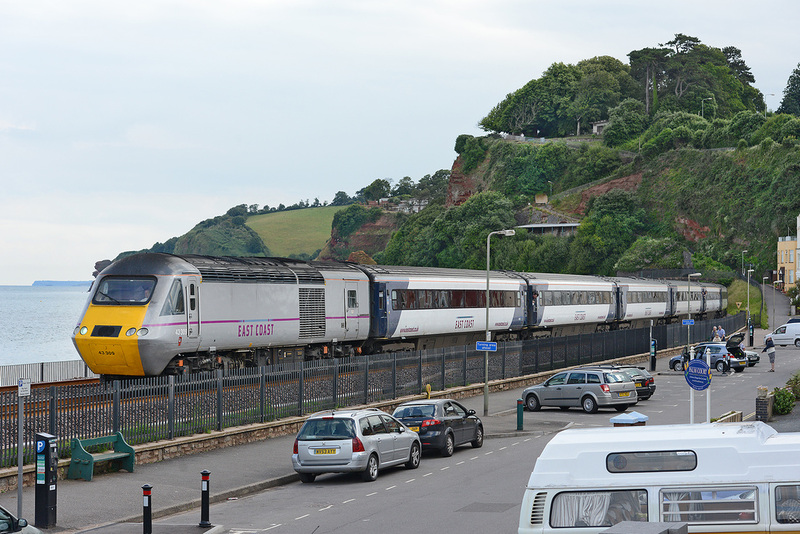 221126 up Dawlish Sea Wall, 1M41 10.07 Paignton to Manchester Piccadilly 20 June 2014. 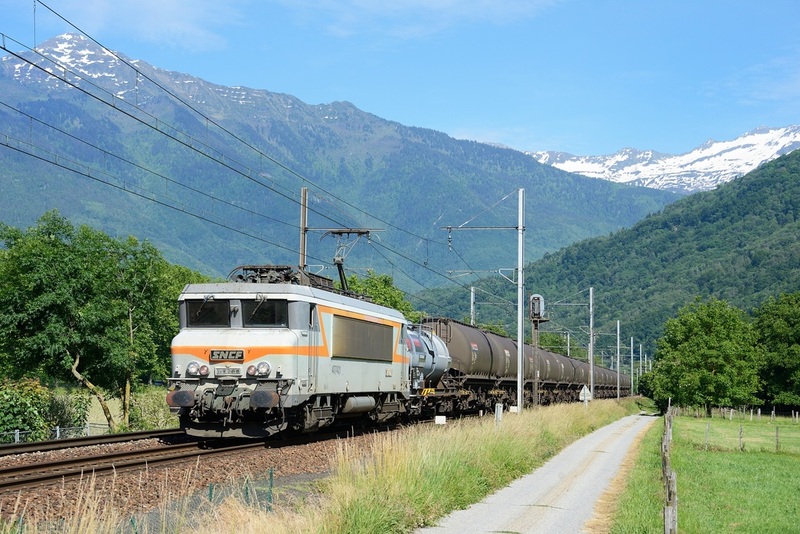 DB-S Class 67 No. 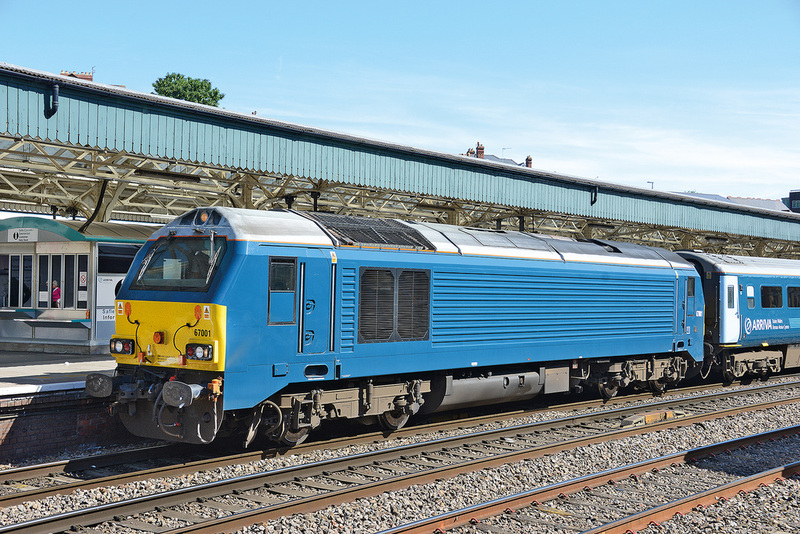 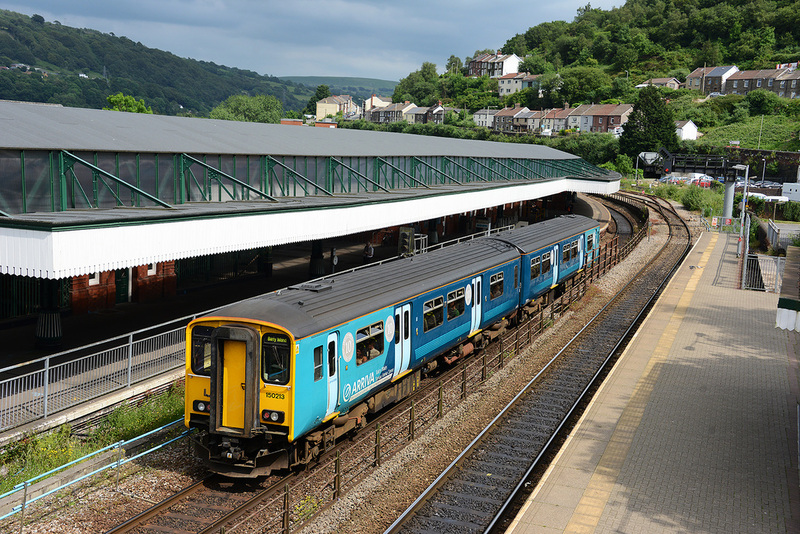 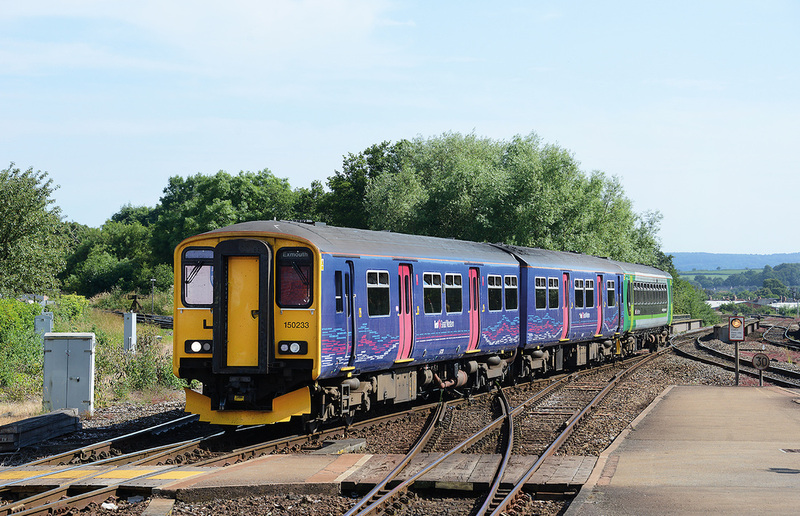 67001 painted in Arriva Trains livery is seen at Newport on 19 June 2014. 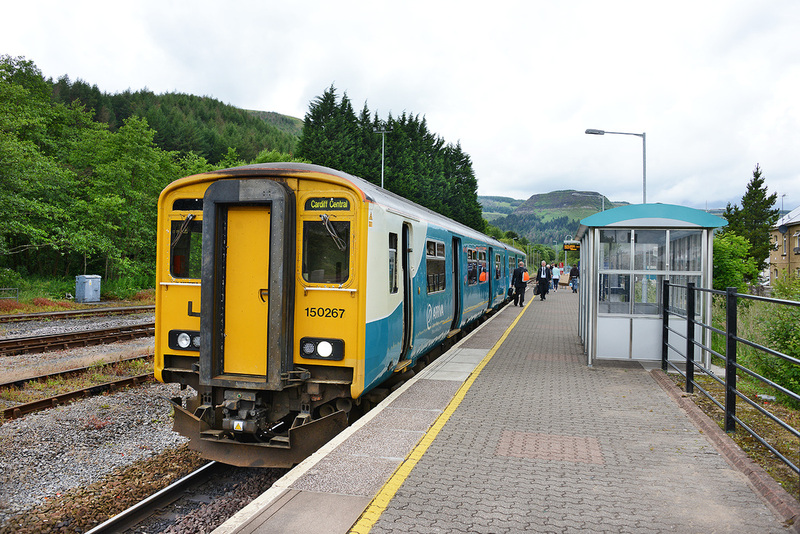 150213 arrives at Pontypridd on 14 June 2014 with 2Y65, 15.22 Aberdare to Barry island. 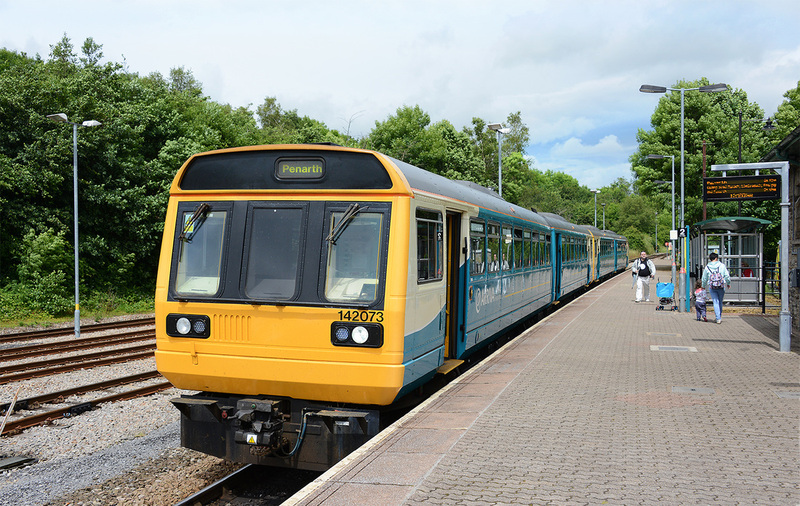 Set painted in Arriva Trains Wales 10 year livery. 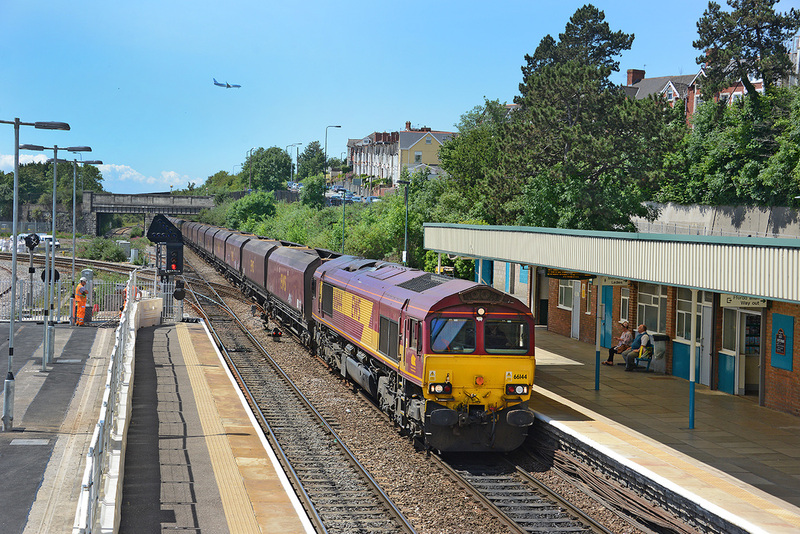 66144 passes through Barry station on 19 June 2014, powering 10.50 Aberthaw Power Station - Tower Colliery empty coal hoppers. 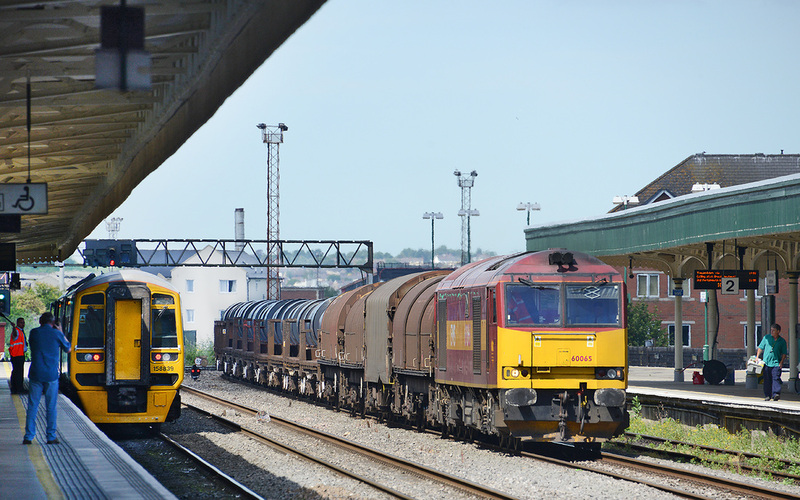 60065 passes through Cardiff Central, 6M86, 09.23 Margam TC - Dee Marsh loaded steel. 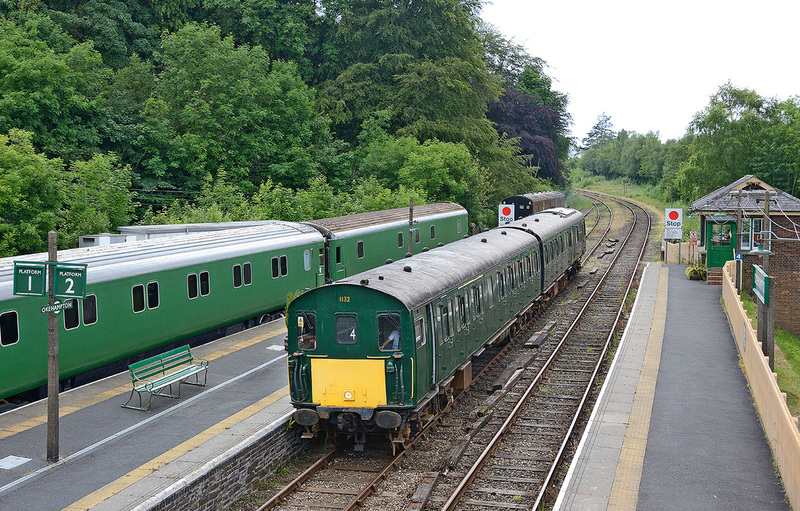 19 June 2014. 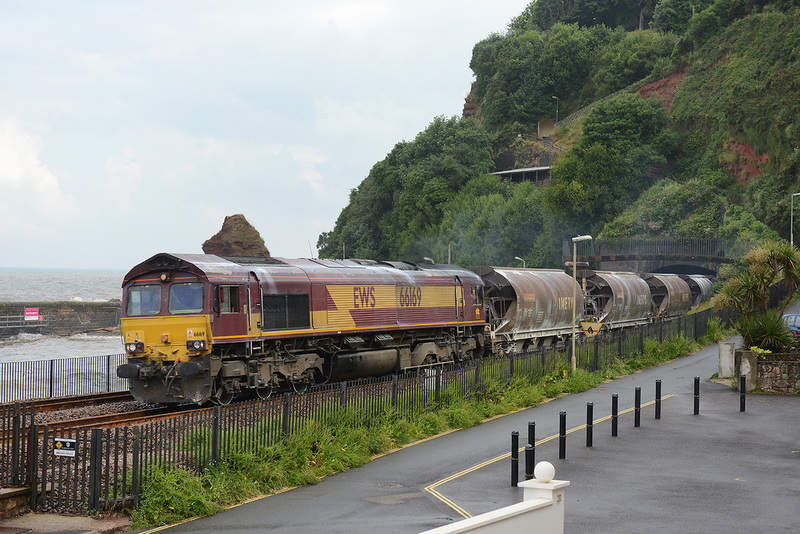 66106 passes through Cardiff Central, 07/00 Portbury - Aberthaw PS loaded coal. 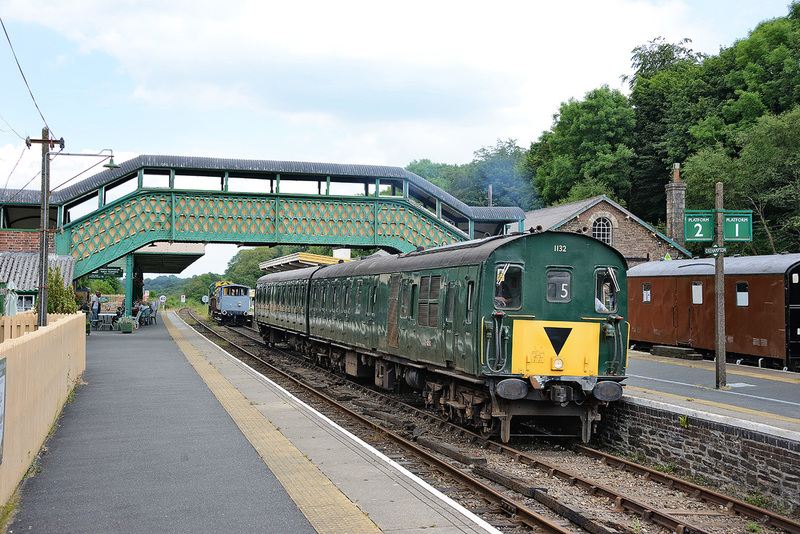 19 June 2014. 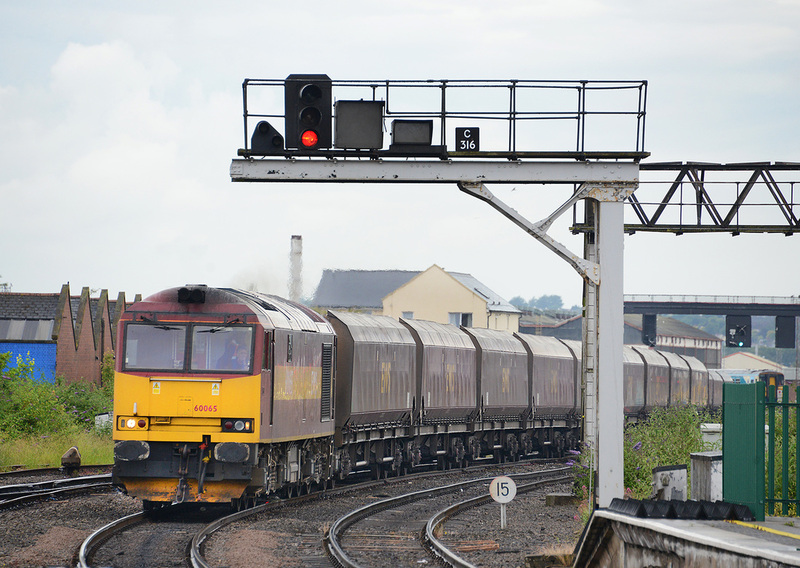 66001 up Newport, 08.55 Margam - Redcar BSC loaded steel. 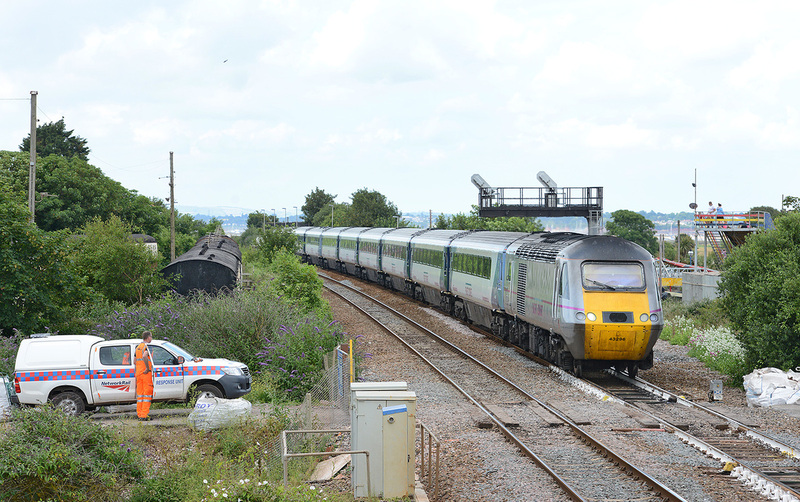 19 June 2014. 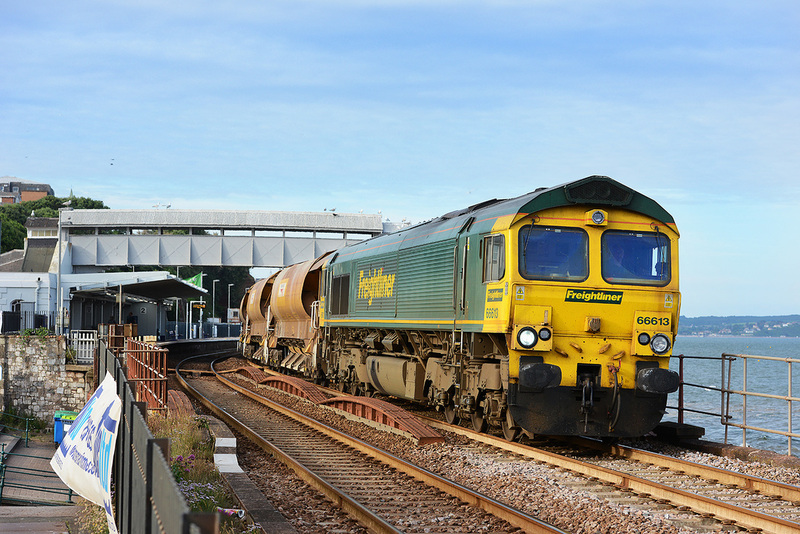 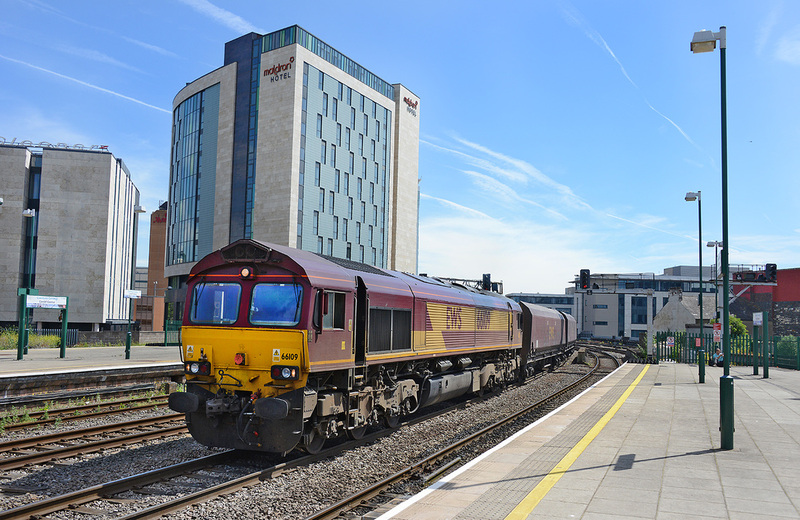 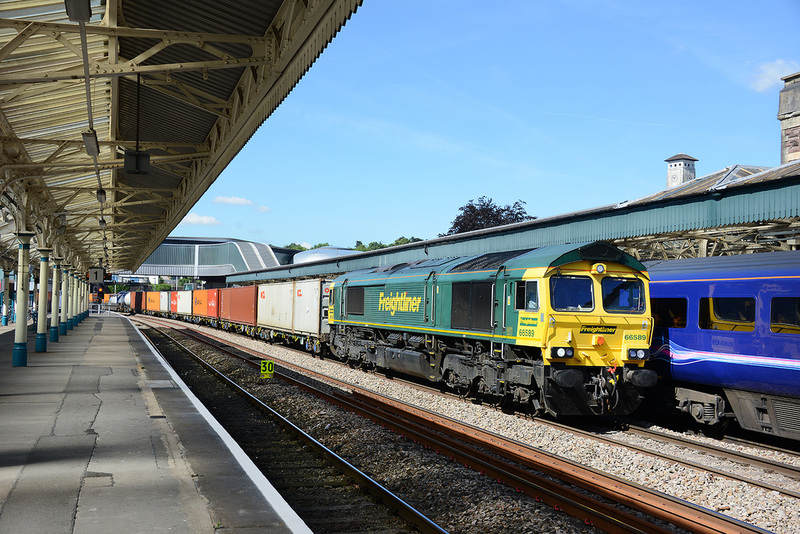 66589 passes Newport South Wales, 09.58 Wentloog - Southampton liner service, 19 June 2014. 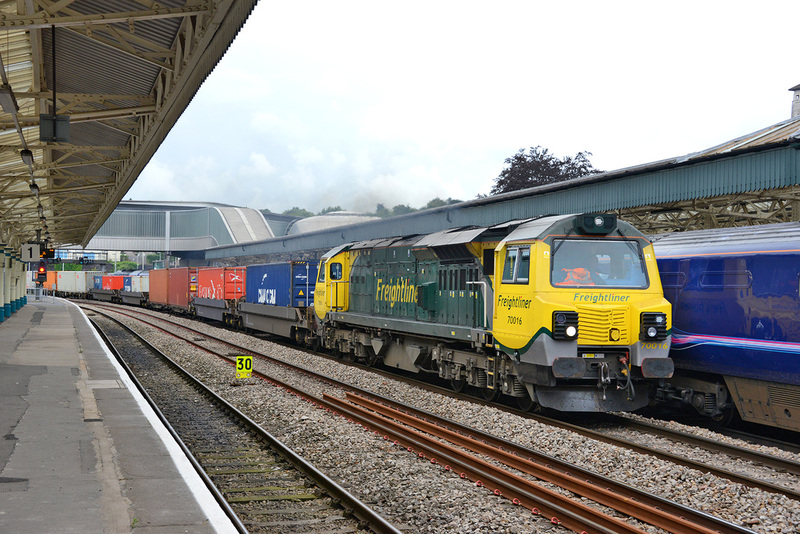 60019 up Newport, 05.00 Robeston - Westerleigh, 19 June 2014. 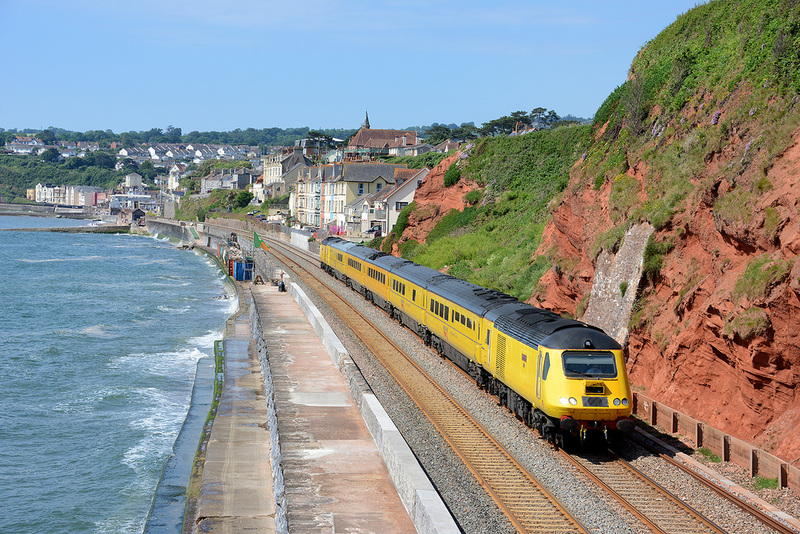 See a new section covering a trip to France in June 2014. 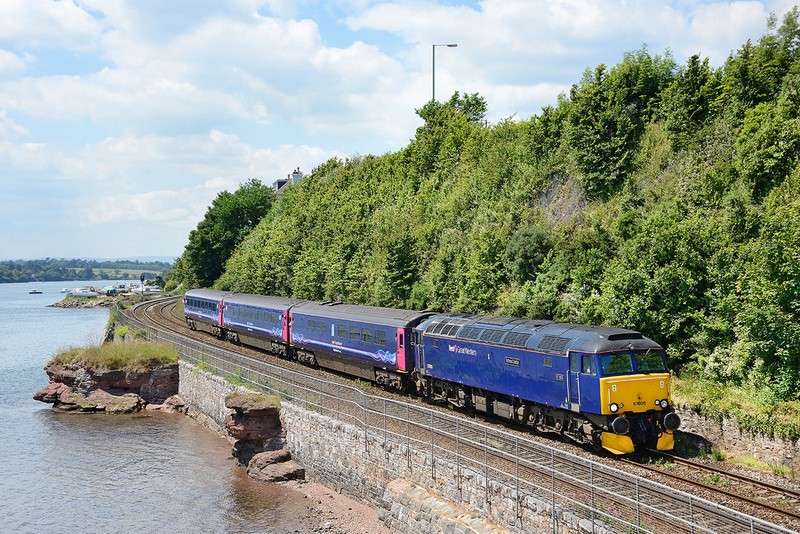 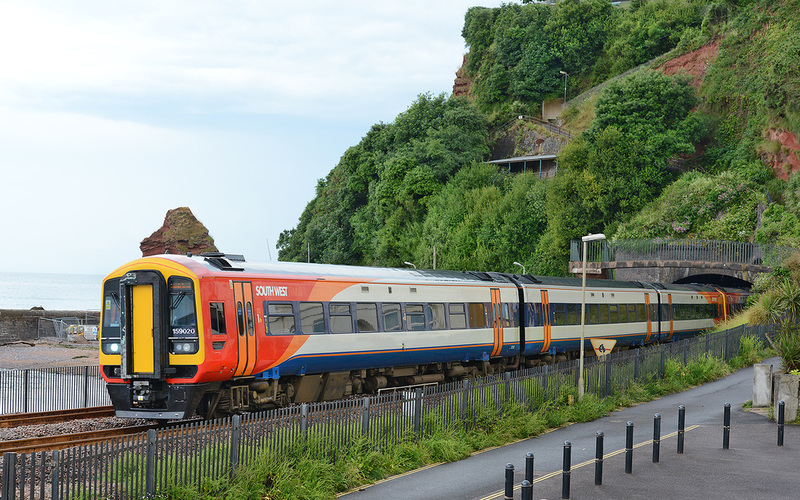 Led by DBSO 9708 the return leg of train 3Q01, the 17.06 Exeter Riverside to Exeter Riverside via Paignton and Heathfield emerges from Kennaway Tunnel, Dawlish during the early evening of 17 June 2014. 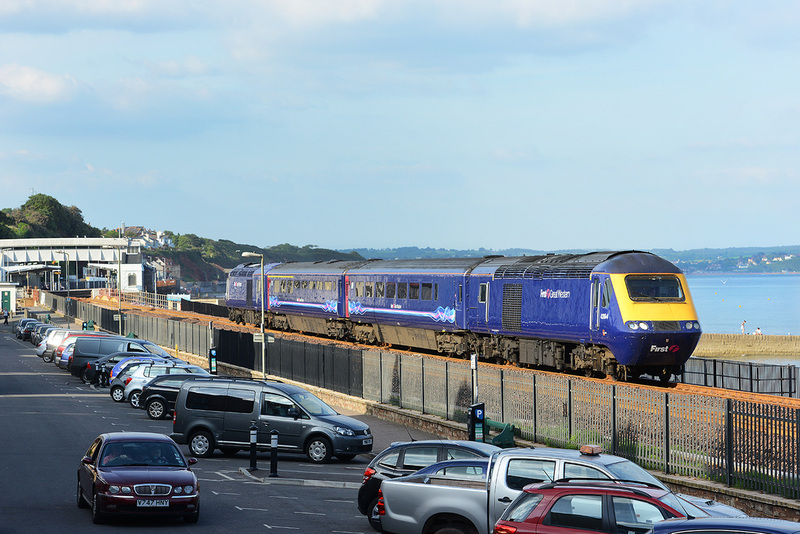 From the front the Ultrasonic Test Train is formed of vehicles 9708, 62384, 977985, 977986 and Class 31 No. 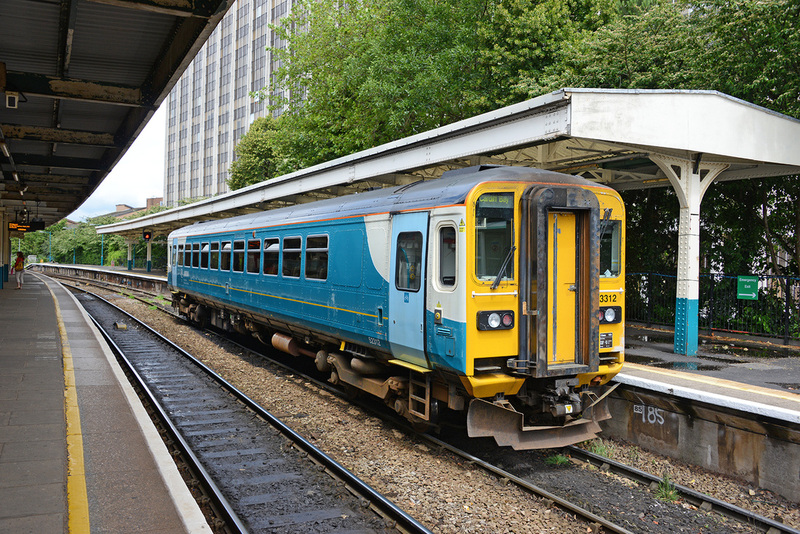 31233.